Inner city areas are exciting but such environments are filled with fear and insecurities. Traveling through the urban environment without the safety and comfort of a vehicle presents problems for the commuter. 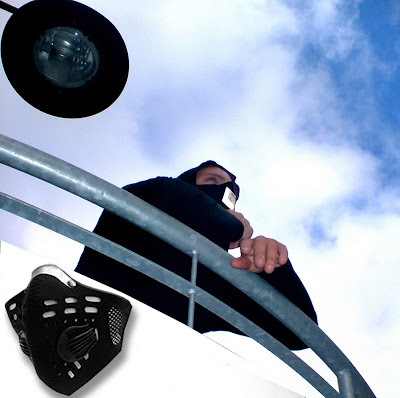 The Ninja hoody addresses the need of problems caused by traffic pollution and increasing CCTV. Urban Commuter Wear takes inspiration from the 'rude boy cool' of street-wear. The hood has a high neck pocket for a Pollution/dust respirator mask. The hood conceals the wearers face from video surveillance and offers a degree of anonymity. Reflective panels on shoulders, hood and body increase sidewalk safety and security. This offers protection from the environment, giving power and confidence to the commuters of our cities. Exhaust emmisions/sub micron particles are removed through Charcoal Filters. Neoprene construction. Rapid Airflow Valve System.